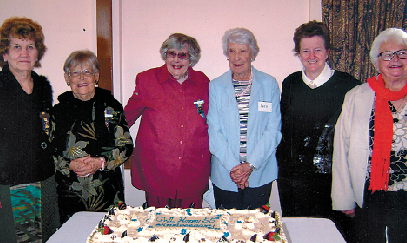 Leading the way: Past CWL presidents, from left, Irene Ross, Yvonne Lofthouse, Isabel Corvessa, Kath Rice and Shona Cobham and Dot Empen. THE Catholic Women’s League in the southern part of Brisbane archdiocese is making its mark. This was evident when Burleigh Heads, Surfers Paradise, Southport and Runaway Bay members gathered at the Clear Island Waters Catholic church for the combined Gold Coast annual general meeting. “A Mass was celebrated by the Surfers Paradise chaplain Fr Tim Harris and the four presidents processed in with their banners prior to the beginning of Mass and this made quite a statement to those assembled for Mass,” CWL publicity officer Margaret Begg said. “No matter where CWL is they are the quiet workers of any parish yet their volume of work is unmeasurable. “They are the backbone of any parish and their charitable works are so appreciated by those who receive it. “Fundraising enables donations to be given to many although this is not the main concern as just being there for one another is so important be it as a friend of as support in times of need. Mrs Begg said this was the fifth AGM for Surfers Paradise and a luncheon was held at Palmer Golf Club and a cake was cut by eight past presidents. She said Burleigh Heads also celebrated 50 years during the year and this was a grand occasion with chaplain Fr Pat Malony celebrating Mass at the Infant Saviour Church. “Donations have been given to St Vincent de Paul, Majella House, Boystown, Fr Chris Riley, Rosies and Ozanam Villa,” she said. Runaway Bay branch has had a year with a difference with a farewell to their chaplain Fr Barry Grayson and the appointment of long standing member and past president Pat Dehnert as their patroness. Patroness Pat gave a message of tribute and a gift to Fr Barry Grayson at his farewell. “Members participate in voluntary work such as teaching at TAFE, looking after elderly and attending the school Mass to help children follow the Mass,” she said. Mrs Begg said the value of Catholic Women’s League, which in September will be 86 years in existence founded by the late Archbishop James Duhig, was well known. “We are often told that we are the unsung quiet achievers of the Church for all this is done under our motto: For the honour and glory of God. I am sure you would have to agree,” she said. New members are always welcome in any branch throughout the Archdiocese. Call Archdiocesan president Bonnie Mulroney on 07 3221 1924 if interested in joining.